August and September are times when many people think of travel, and travel makes me think of travel sketches. 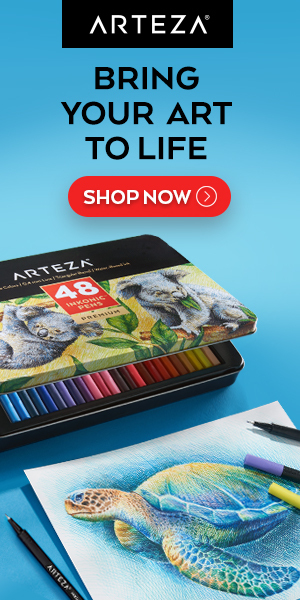 There is a particular pleasure in travel sketches; they carry a personal view and flavor quite unlike travel photographs, in that the artist is showing you their vision and feeling for the place and time in addition to a representation of its appearance. Junko Ono Rothwell, an artist based in Georgia in the Southeastern U.S. has posted a number of her travel sketches in watercolor and pastel on her web site. These are from her visits to Italy (above, left), France (above, right) and Ireland. 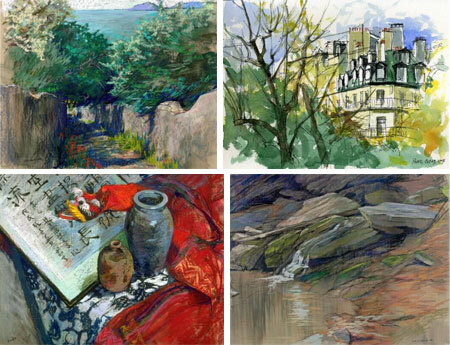 Her sketches bring to bear her experience in painting landscapes in both oil and pastel. Her landscapes here in the U.S. often focus on marshlands and small streams, both Groegia and on the mid-Atlantic coast. On her site you will also find her nicely realized still life paintings, also in both pastel and oil, and her watercolor floral studies. There is also a selection of figure work. Her pastel renderings make good use of the textural characteristics of the medium, which lies somewhere between painting and drawing, and she brings some of that surface texture into her oil painting to very nice effect, with textural paint strokes and a wonderful use of broken color. Rothwell studied in Japan at Okayama University and in the U.S. at Cornell. Her work has been in exhibitions and collections in both the U.S. and Japan and has been featured in a number of books and magazine articles on pastel, floral painting, and landscape. Rothwell’s landscapes are done en plein air (see my recent post on pochade boxes), catching the fleeting atmospherics and light only available to the painter’s eye on location, just as she captures the immediate feeling of of a foreign place and time in her travel sketches. I can tell you little about Adam Brockbank, except that he is a film industry concept and storyboard artist, and quite a good one. 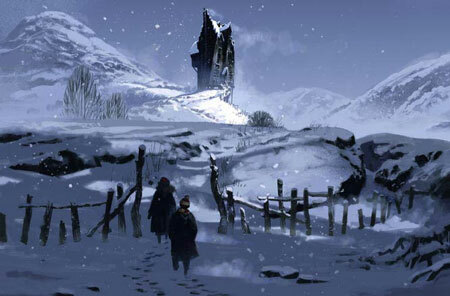 His site doesn’t include any biographical information, but does, fortunately, showcase a number of his terrific concept paintings and drawings for movies like Harry Potter and the Order of the Phoenix, Harry Potter and the Goblet of Fire, Harry Potter and the Prisoner of Azkaban (image above), Harry Potter and the Chamber of Secrets, Alexander, Troy, Spiderman 2, Tomb Raider, Tomb Raider 2, Fire from Heaven, X-Men and Sleepy Hollow. There is also a selection of storyboard work from films and television productions like Harry Potter and the Philosophers Stone, Dinotopia, Alice in Wonderland, Lost in Space and The Borrowers. You can see a more complete list on the IMDB site. His storyboards are clear and crisp, with just enough tone work to suggest lighting and atmosphere. His concept art ranges from briefly notated sketches to fully rendered paintings of complex and large scale scenes. He seems particularly adept at portraying the cities and scenes of ancient civilizations as depicted in movies like Alexander, Troy and Fire from Heaven; combining a National Geographic feeling of historical reconstruction with a cinematic flair for drama. In between his lightly rendered and highly rendered approaches are paintings that frequently look more rendered than they are, in which his artful economy of notation conveys a great deal of atmosphere and mood in the choice of large areas of color balanced with smaller passages of detail. There is also no indication of medium or technique on the site, but it looks like he paints digitally, though his work can have a feeling of traditional painterly materials. I can’t give you direct links to sections because the site is in Flash, but be sure to view his wonderfully realized historically themed paintings for Fire from Heaven. Addendum: Adam was kind enough to write and let us know that he has been working on a new comic called Mezolith, written by Ben Haggarty, that debuts next week in issue 15 of The DFC, a UK kids comics anthology. You can see a preview here. Brooklyn based artist David Jon Kassan was born in Arkansas and studied in Philadelphia, New York and Florence, Italy. 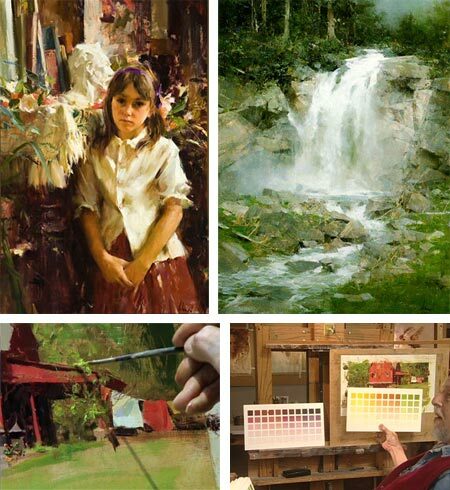 He has lectured, taught and given workshops at numerous universities and art centers, including the Rochester Institute of Technology, Western Illinois University, Syracuse University, National Academy School of Fine Art, the University of Alabama, the National Academy of Design and the Salmagundi Center of American Art. 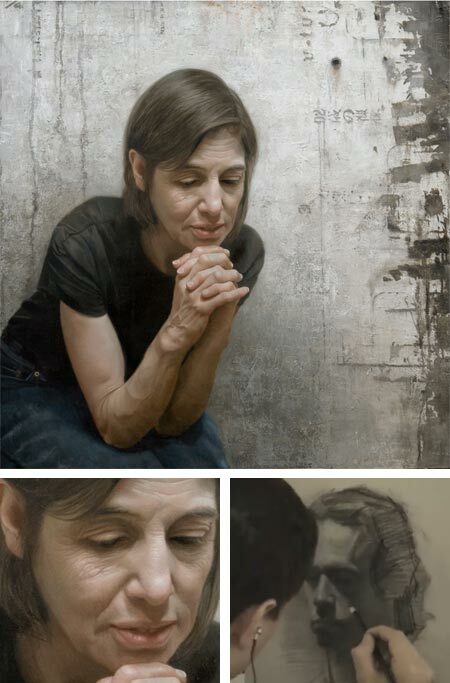 On his web site you will find examples of his striking realist portrait and figurative paintings, in which he often contrasts the colors and textures of his subjects with the rough textures of age-worn urban interiors. He seems so fascinated with the latter that he actually does preparatory studies of wall sections, investigating the textures of aging plaster, exposed lath and peeling paint. His real fascination, though, is portraiture, and specifically, the anatomy underlying the portrait and figure. There is a time-lapse video on his site of a portrait demonstration at the Salmagundi Club in New York, three hours condensed into 8 minutes (image above, lower right), in which you can see the emphasis he places on the underlying geometry of the face. There is also a PDF booklet available for a modest fee, of An Artist’s Guide to Portrait Anatomicae, originally prepared for his students. There is a selection of his drawings on the site. Though they are brought to a fairly high state of rendering, they are largely anatomical studies. Kassan also has a blog, in which you can see some works in progress, studio and demonstration photos and a video showing his paintings on display at the L.A. Art Show. His paintings show the kind of naturalistic fidelity that only comes from careful and incisive observation, combined with a solid grounding in traditional technique and anatomical study. His palette is intentionally subdued, as are his compositions, so that the highest chroma passages are often in the warm skin tones in faces where small blood vessels run closest to the surface. 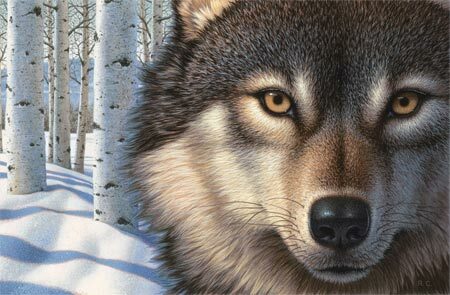 Richard Cowdrey is an Ohio based illustrator with a particular affinity for animals. He has illustrated numerous books for children and teens including the popular Bad Dog, Marley and its follow-up A Very Marley Christmas, as well as the NYT Bestselling series Guardians of Ga’hoole. In addition to owls and dogs, other animals feature prominently in his editorial illustration, all rendered with a devoted attention to detail and texture, particularly evident in his handling of the textures of furred animals. You can see that to advantage on his web site in his gallery of illustrations for Calendars and Cards and his selection of Prints. Cowdrey’s clients include Macmillan McGraw Hill, Workman, Harper Collins and Bantam Books, as well as other commercial and institutional clients. In addition to his own site, there is an extensive portfolio of his work, and perhaps a wider range of his subject matter, on the Shannon Associates site, which also has larger images. I’ve wanted to do a post on Rudolph Zallinger for some time, but I keep putting it off in the hope that more of his work will be posted on the web. Unfortunately, that doesn’t seem to be happening. I may still be able to make some people who aren’t already familiar with him aware of his work, even if I can’t show you a great deal of it. Zallinger was one of the pioneers of of paleontological art, perhaps second only to Charles R. Knight in that respect. Zallinger is best known for his stunning 110×16′ (33.5×4.9m) mural, The Age of Reptiles, that covers the entire east wall of the Yale Peabody Museum’s Great Hall (watermarked poster version here). The mural depicts the evolution of life on earth over 300 million years, with different sections, separated by the visual device of foreground trees, for geologic periods. It was painted with egg tempera in the fresco secco method; meaning “dry plaster”, as opposed to the more familiar traditional method of painting with into wet plaster (buon fresco) as practiced by Michelangelo for his frescos in the Sistine Chapel. Rudolph Franz Zallinger was born in Irkutsk, Siberia to Austrian and Polish parents. They eventually emigrated to the U.S. and settled in Seattle where Rudolph was raised. His early interest in art was encouraged; and at age 17 he started study at Yale University’s School of Fine Arts on a merit scholarship as a painting major, and was also trained in illustration. He taught at the school after graduating. He also started doing some scientific illustration and his talents were noticed by the director of the Yale Peabody Museum, who approached him about the possibility of doing a mural on the museum’s east wall. Zallinger undertook a six month crash course in prehistoric plant and animal life and comparative anatomy with scientists from Yale and Harvard, and spent a year and a half creating preliminary studies and sketches before commencing work on the mural, which took three and a half years. The museum appointed him “artist in residence” a post he held for the remainder of his life. 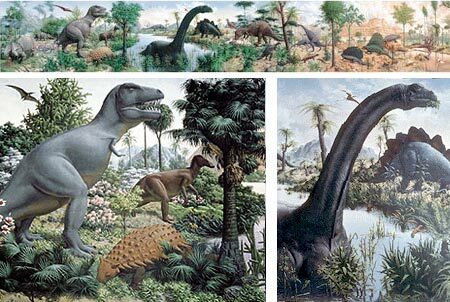 Life magazine commissioned Zallenger for a series of illustrations and covers depicting prehistoric life, and his work also appeared in several books, notably The World We Live In, culled from the Life magazine articles, and The Giant Golden Book of Dinosaurs and Other Prehistoric Reptiles (which I still have my treasured copy of — look for it used, see a preview here). One of his commissions for the magazine was later expanded into a new mural at the Yale Peabody Museum of Natural History as The Age of Mammals, depicting prehistoric mammals that, though they don’t get the same press, are every bit as wonderfully weird as the dinosaurs. The past is always changing, particularly the distant past, as new information is brought to light. Knight’s active, leaping dinosaurs were replaced by Zallinger’s slow, gravity-bound behemoths, which were based on the prevailing scientific theories of the time. In them you’ll see the classic upright, tail dragging stance of tyrannosaurs, and elongated sauropods semi-submerded to support their weight, that were characteristic of mid-20th Century paleo art. It was Zallinger, in fact, who set the standards for that art, the artistic component of which has seldom, if ever, been matched. Since then, the continued revision of our vision of the past has gone back to more lively dinosaurs with very different interpretations of anatomical reconstruction (which some modern paleo artists carry too far, indulging in fanciful depictions of 5 ton tyrannosaurs sprinting like leopards and brachiosaurs rearing on their hind legs in defiance of physics and bio mechanics). The Yale Alumni Magazine commissioned contemporary artist Alan Male to create a virtual update of Zallinger’s mural, showing the animals in a more modern interpretation. As anachronistic as they may seem in light of modern interpretations of dinosaurs, Zallinger’s inspired visions still have an uncommon visual power, unlike any paleontological artist before or since. They are now best appreciated as artworks, and powerfully evocative artworks. Zallinger studied traditional painting techniques and his paintings of dinosaurs look as though they are the interpretation of a Renaissance master, which I find just an amazingly great combination. Reportedly Daniel Varney Thompson, the most authoritative translator of Cennino Cennini’s 15th-century classic The Art of Painting, on seeing The Age of Reptiles nearing completion, stated: “That wall is the most important since the 15th Century”. Unfortunately, the Peabody Yale site is a bit confusingly organized; and, though it has information about the murals, including podcasts by contemporary scientists on the subject, and an article on the making of the mural by Zallinger himself; it is disappointing shy on images. They seem so desperately paranoid that someone will print a low-res version on a T-shirt or something, that they would apparently rather let Zallinger languish in obscurity than give the web audience a taste of how fantastic his work was. Though I have never seen the actual murals (they’re high on my list whenever I get to Massachusetts), I have had the privilege of seeing a small (perhaps 12×50″) preparatory painting for the larger work. I simply love the feeling in Zallinger’s work, his Renaissance flavored visions of steamy prehistoric jungles where hulking, leather skinned giants lashed at one another in slow motion fury under storm-darkened skies — wonderful stuff.